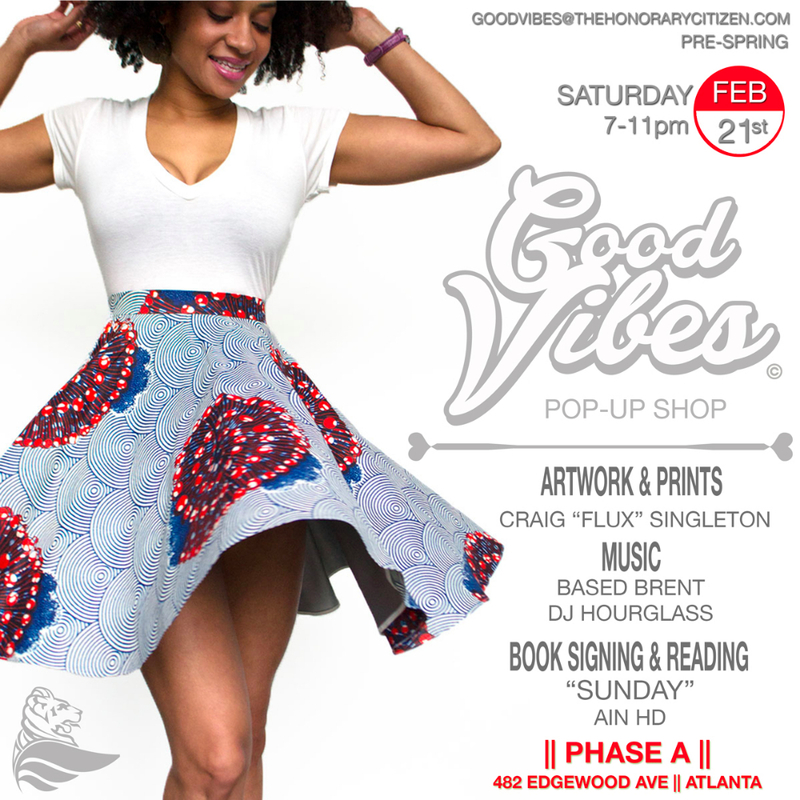 Small batch clothing brand “The Honorary Citizen” of Atlanta, GA is launching their first late night Pop Up retail shop experience, “Good Vibes” of 2015. Phase A, 482 Edgewood Ave. Atlanta, GA 30312. Drinks. Music. Art. Fashion. Good Vibes. variety of cut and sew garments, vintage tees and accessories. Good Vibes is a unique shopping experience only occurring quarterly. for 'Sunday' the newest book published by Ain HD. ‘Sunday‘ is part confessional, part poetic documentary. Touching on social justice issues, love and relationships,family and life experiences, Ain HD uses her voice to navigate through the topics we don’t always bring to the dinner table. Meet and greet Ain HD at Good Vibes this Saturday. She will be there selling and signing copies. There will also be a live reading from the book ‘Sunday‘ by Trip Freeman of Atlanta Rap group, W.I.C. The Good Vibes soundtrack will be finely curated by Based Brent and DJ Hourglass.